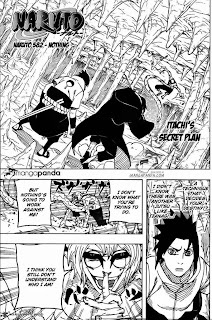 Chapter 582 tells the story of Kabuto's sad past. Also explained about the background of Kabuto's glasses. On the previous chapter Itachi states that he'll use Izanami, a jutsu that can decide destiny. Izanami-no-Mikoto meaning “she who invites” is a goddess of both creation and death, as well as the former wife of the god Izanagi-no-Mikoto. She is also referred to as Izanami-no-kami. But before Itachi releases his jutsu, Kabuto attacks him with hermit technique "Muki Tensei" (inorganic transmigration), a technique that works by giving life and controlling something that isn't alive. Itachi caught and pierced by a sharp chunk of that comes from all directions. Kabuto comments that Itachi may indeed be protected by Susano'o but because of that he was so much slower. Kabuto said he was not going to kill Itachi, but it just will rewrite its control program. When Kabuto move towards Itachi, Sasuke releases Amaterasu to expel Kabuto with black flames, as well as create a protective ring of fire around Itachi and himself. Kabuto commented that he believes will win with its current capabilities that can create and control with all the knowledge about the natural principle Orochimaru has been learned so far and with an increase of only a serpent into a dragon. Kabuto on to say that perhaps it was the most closest to the ability of the legendary Six Paths Sage (Sage of Six Paths), and Uchiha no meaning for him. Itachi commented that Kabuto now reminded him of himself in the past, so that's why Itachi believe Kabuto will lose. Itachi sympathize with Kabuto, especially with his past as a spy whose life should be full of lies. Itachi continued that he was aware of at this time to recognize oneself is better because then so understand what can and can not be done. 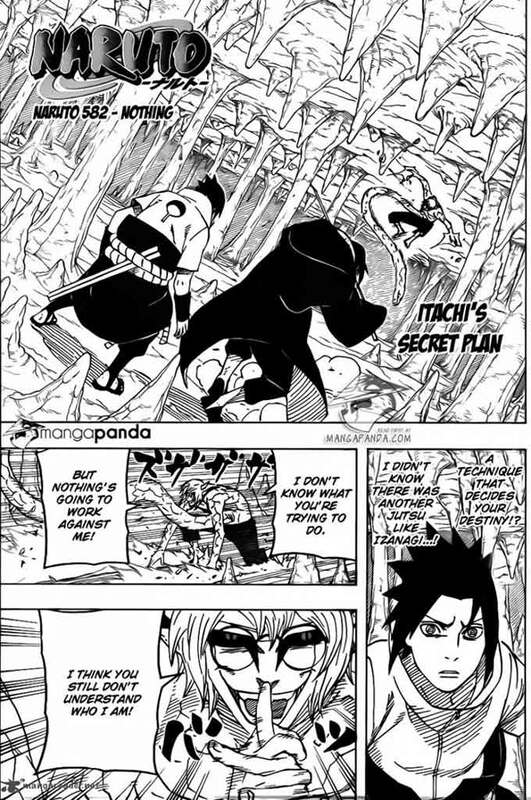 Kabuto commented on Itachi, instead of admitting that there are things that can not be done is tantamount to giving up? Behind Itachi replied: "No! !, That is to forgive yourself for things that can not be done.